Residents of Norwich: Have you seen a man blowing giant bubbles larger than a five-year-old at Marion Cross School? 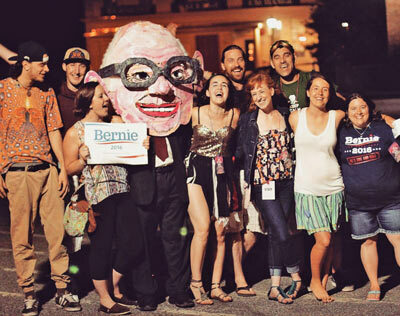 Or did you notice in the town picture that one of the residents has on a massive Bernie Sanders Puppet head? Perhaps maybe at Dan and Whit’s last year, you noticed an out-of-the-ordinary housing ad? It wasn’t on a white, 8.5 x 11 piece of paper, but a colorful 3D cardboard cut-out featuring bees, ukuleles, chickens, a red Canadian Maple leaf, and individually drawn portraits of a family of four. They were seeking a house in Norwich by July 1st, which was clearly noted as Canada Day. These were the works of master hobbyist and founder of Make Your Own Fun, Dr. Ken Leslie. For the curious, yes the search was successful, and Ken, along with his wife Shannon and two sons Journey and Phoenix, recently moved to a house upon the steep Glen Ridge Road. As for the focus on Canada, they are not exuberant Canadophiles, but actual Canadiens. Although he grew up in Ontario, he and his family were living on the islands of Haida Gwaii off the coast of British Columbia before moving to Norwich over two years ago for his job as a consumer neuroscientist at Merchant Mechanics, located one mile south of Hanover. With an impressive academic background, this is not Ken’s first time in the Upper Valley. After earning a Neuroscience PhD at Brandeis University, he came to Dartmouth to do a postdoctoral fellowship in Psychological and Brain Sciences in the early 2000s with Dr. Mike Gazzaniga. Although this was before marriage and starting a family, Ken has always been an active participant in Upper Valley life. If you’ve seen anyone sporting the stylish Upper Valley zip-up hoodies sold at Revolution in White River Junction, Ken was the original designer. 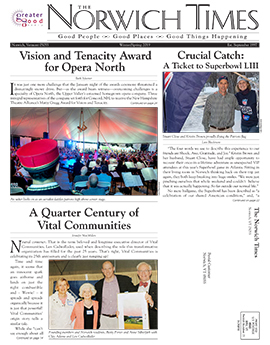 He was also a pioneer and editor of the uvScene.com, an early social media website that promoted face-to-face community by hosting events, including dances and creative fundraisers, many of them hosted at the now defunct India Queen restaurant in Hanover. In some ways the uvScene could be thought of as a precursor to the functions of DailyUV.com or the Upper Valley VT/NH Facebook page. Make Your Own Fun is Ken’s website (myof.org) that features his hobbies and creations while encouraging others to take part as well. From animation to beat boxing to creating giant puppets, there appears to be few things he’s unable to do. In his words, Make Your Own Fun is about using the power of play to create optimal conditions for learning, relaxation, and enjoyment while building community and promoting well being. As eluded, his hobbies aren’t something that live only inside the confines of his home. He’s dazzled with giant bubble shows at the Montshire and has run the kids zone at music festivals in Canada and the US. At events, he goes by Dr. Ken, a factually accurate nickname bestowed to him during his post doc days by a friend who had yet to receive his PhD. Initially it annoyed him, but when he needed a stage name, he conceded it had a nice ring. Ken’s infamous bubble blowing prowess started just before his older son Journey was born, initially learning from YouTube videos. When bubbling, he’s often dressed in a colorful costume such as a paint covered overcoat and hat. In action, he looks almost like a wizard casting gentle spells with his bubble wand. If one giant bubble isn’t whimsical enough, he can even blow bubbles within bubbles. Bubbles are endless fun that kids love to chase, and will force even the most hardened adults to crack a smile. 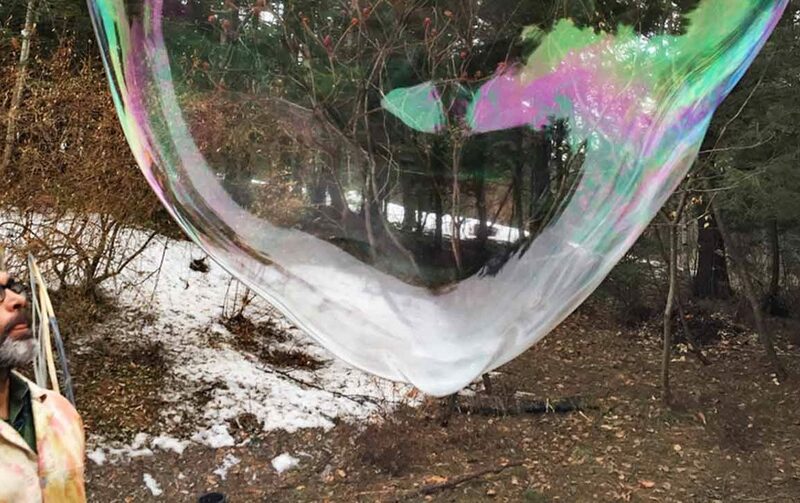 As to what’s special about bubbles, Ken says “they teach embracing the impermanent.” Bubbles are ephemeral. There’s a beauty in their aimless trajectory and fleeting existence. Ken is a fervent advocate of making your own fun. Fun doesn’t have to come via a brand new toy from Walmart. The box itself can provide superior entertainment. That’s why one of his favorite mediums to work with is cardboard. “It’s the ultimate toy” says Ken. It’s free and can be constructed into nearly anything. Kids love it because it can be easily drawn and painted upon. He turned his son Phoenix’s stroller into a Tesla tractor (sadly they don’t actually exist) for an organic farming event, and if you think a cardboard Christmas tree wouldn’t achieve sufficient holiday spirit, you’d feel otherwise upon seeing the tree in his house. But as fun as cardboard is for creation, so is its destruction. It can be controllably burned, and there are few things more enjoyable than watching the glow of fire. Music is also a passionate hobby of his. 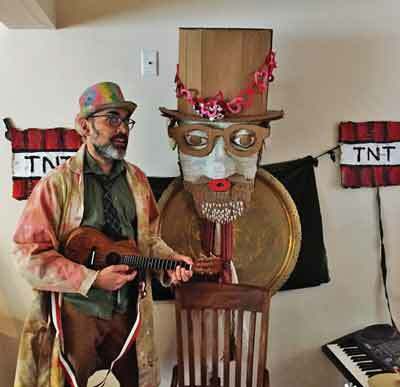 As a child he took formal training on the violin; now he’s self-taught on the ukulele. He realized that if you make a sound, and enjoy the sound, then you’re playing it right. All of this leads to a feedback loop that leads to mastery and, most importantly, the enjoyment of making music. He’ll walk around Dan and Whit’s strumming the ukulele, creating a stress-free environment for shoppers searching for socks and stewed tomatoes. During the holiday season, he and a friend spent Saturday mornings at the Norwich Post Office, relaxing the frenzied employees and customers by playing Christmas carols. As if creating a giant Bread and Puppet-style Bernie Sanders head wasn’t enough of an artistic challenge, in the future, Ken is looking to enhance his crafts by further refining his technique, and moving more toward the fine arts. 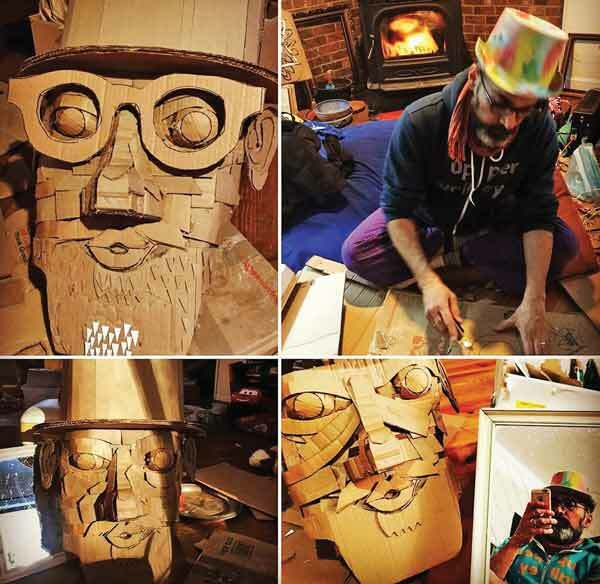 On the wall in his living room is a current work-in-progress: a giant puppet self-portrait. He intends to have it ready for the Unifier Music Festival (unifierfestival.com) in Tolland, MA this Solstice (June 22-24), and is engineering it so it can blow bubbles. He considers his Make Your Own Fun activities to be his form of cultural currency. A way of spreading enjoyment while also bringing community together to have and share sweet experiences. He recalls a particularly warming moment back in British Columbia; a renegade bubble floated upward in the sky seemingly forever, and everyone stopped what they were doing to watch. There are moments when he starts to feel a twinge of self-consciousness over his colorful dressing style when among more traditionally dressed crowds, but ultimately he’s a supporter of self-expression. He wants kids to understand that “we don’t all have to be cookie cutter. If you want to play your ukulele and blow bubbles on the playground, you can do that.” In other words, don’t stop doing what you want to do just because you fear being the weird kid.